Our junior surf lifesaving nipper program introduces lifesaving to children aged from 5 to 14 years. SBSLSC covers the entry fees for the targeted carnivals providing each competitor meets their patrol obligations and is a current financial member. Minimum patrol hours must be met to be eligible to compete at State & Australian Titles. The following patrol hours are required to be completed from 1st January to 31st December in the same calendar year. SBSLSC requires all members to continue with their patrol obligations into the new year. Swansea Belmont Nippers involves teaching kids the basic surf skills of wading, dolphin diving, surf swimming and board riding as well as learning basic surf survival skills. Kids also engage in beach activities such as such as running, relays and beach flags. Our younger age groups, 6’s and 7’s also enjoy games such as shark games (aka Red Rover Cross Over), ball tossing and bucket team games on the surf shore. All kids learn team building skills and socially have fun with friends. Held at Blacksmiths Beach, our nipper program is conducted on one of the safest beaches in our region, kids experience water confidence activities and racing every week. For further information please contact our Director of Junior Activities, Matt Rees – 0437 021 917 or our Junior Secretary, Carolyn Connolly 0407 938 751. The Surf Race involves swimmers starting on the beach and then running, wading and swimming about 170metres to sea to round as set of buoys and then return to the beach. The event concludes with a run finish to the flags placed on the beach. The rescue tube rescue event features four team members: a patient, a rescue tube swimmer and two rescuers/assisters. The event commences with the patient swimming to their allocated buoy and signalling back to the beach. The rescue tube swimmer then swims to rescue the patient with the assistance of swimming fins and a rescue tube. Upon arrival at the buoy the rescue tube swimmer harnesses the patient into the tubes and swims back to the beach. As the rescue tube swimmer and patient approach the shore the two rescuers enter the water to assist in getting the patient across the finish line. The two person rescue tube race is similar to the 4 person rescue tube rescue race except without the assistance of the two rescuers. The patient swims out to the buoy, signals the rescue tube swimmer who then swims out (with the assistance of fins), collects the patient and swim them back to the finish line on the beach. SLSA conducts several events aimed at highlighting and developing the skills involved in rescue, resuscitation and first aid, assisting members to perform their patrolling duties. Pool Rescue events cover the all important situation of rescuing someone in a backyard or public pool. Manican rescue, tow & obstacle swim are just some of the events. A boat crew shall consist of five competitors, four of whom shall be “rowers” and a “sweep” who controls the boat by use of a sweep oar and commands to the rowers. Boat crews start at the water’s edge holding their boats ready. On the starting signal, crews row around their assigned turning buoy situated approximately 400metres off shore and return to the beach. The winner is the first crew to pass their boat between the finish flags on the beach. The Rescue and Resuscitation (R&R) competition provides the opportunity for SLSA members to demonstrate in a competitive manner some traditional rescue and resuscitation techniques used in Surf Life Saving. R & R comprises of a march on, traditional laying of the surf belt, rescue simulation & CPR simulation. R & R is considered the premier event in Surf Life Saving. 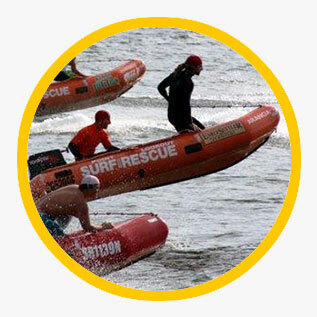 The focus of IRB racing is to hone the abilities of IRB drivers and crew, with five events that generally revolve around the concept of IRB rescues and craft preparation. Multi-discipline refers to events that require competitors to specialise in a combination of swim, board and ski legs, the most notable being the famous Ironman and Ironwoman. 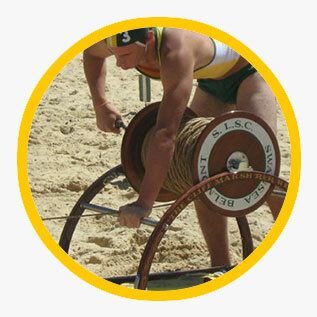 SBSLSC cover the entry fees for the targeted carnivals providing each competitor meets their patrol obligations and is a current financial member. Minimum patrol hours must be met to be eligible to compete at State & Australian Titles. Please contact Leanne Johnson with any questions you may have on leannejohnson2010@hotmail.com or 0414 646 355.